I somehow managed to miss this last month, but I thought it so interesting that it’s worth sharing for anyone else that may also be slow on the uptake. The tobacco giant JTI giant ran a national advertising campaign against plain cigarette packaging in response to the government proposals to include legislation on the issue in the Queen’s speech. It’s a brilliant piece of advertising. 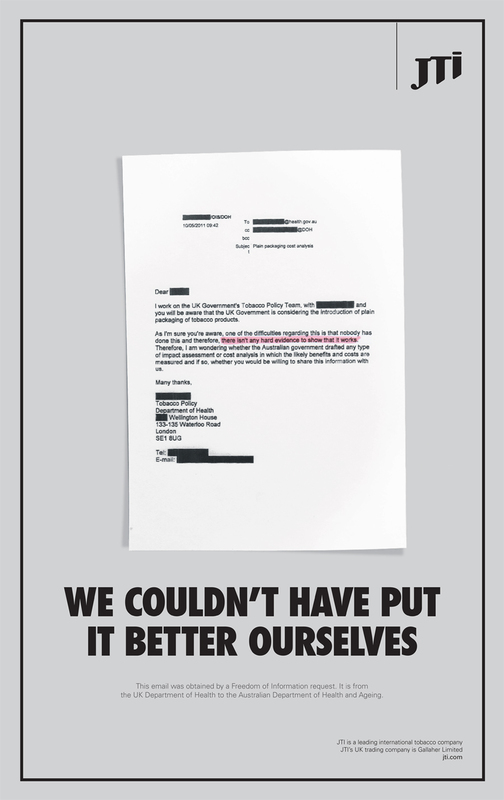 The British public hate the nanny state and this ad very cleverly uses the government’s own words to accuse them of intervening without basis. The ‘We couldn’t have put it better ourselves’ line is a political advertising classic and is usually accompanied by a quotation taken completely out of context. The damning thing about this execution is that the letter is shown in whole.